Idyllic creekside cabin. Great for vacations and quick getaways. 4 BR and 2 BA. 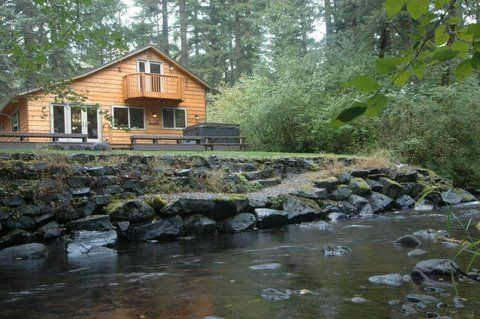 Relax to the sounds of Big Creek as it flows past this beautiful waterfront cabin. Lazy Bears Creekside Cabin has been completely remodeled from floor to ceiling with the highest quality craftsmanship. Our luxury Mt. Rainier vacation home is located about 4 miles from the SW (Paradise) entrance to the National Park, right on Big Creek. It comfortably accommodates 8 people. The cabin features 4 private bedrooms plus a separate game room with 2 single beds. The main floor has 2 bedrooms with queen size beds, and the upper level has 2 bedrooms with king size beds that can each be split into two twins. There are 2 bathrooms, one full bath with tub and shower and one 3/4 bath with a shower. Enjoy cooking in our fully equipped gourmet kitchen, or step onto the deck and use our gas BBQ grill (propane provided). The dining table comfortably seats 8 people. For an extra special breakfast treat, enjoy easy-to-prepare Belgian Waffles. We provide the waffle maker, mix, syrup, coffee, and hot cocoa. Yum! The living room offers an expansive view of Big Creek and features a beautiful river-rock gas fireplace and an LCD TV with DVD player. For fun and games throughout your stay, step into our detached Game Room adjacent to the main cabin and enjoy the full-size pool table, game table, many board games, and a second LCD TV with DVD/VCR/XBox. This room also has 2 built-in twin daybeds and a free-standing gas fireplace. The back yard features a 700 sq ft private deck overlooking Big Creek, complete with 8’ jetted hot tub. There is a large fire pit on the lawn, near the creek, for roasting marshmallows at night. Treat yourself to a relaxing, luxurious stay in the foothills of Mt. Rainier at Lazy Bears Creekside Cabin! The town of Ashford is located at the base of Mt Rainier. Our hope's for the cabin were well surpassed as we enjoyed the beauty of the woods and the lovely sound of a babbling creek. The attention to detail in the cabin was so appreciated as we fixed meals every night and morning in the fully appointed kitchen. We so enjoyed the waffle mix and maker provided for our use. The rooms are all comfortable and the two bathrooms had plenty of space to spread out with numerous extra linens available. We used the fireplace often and the hot tub daily. Great memories were made and we would love to come back to Lazy Bears Cabin in the future! Thank you for a home away from home!! My friends and enjoyed a wonderful weekend. Cabin was immaculate! Loved the pancake waffle mix! All the deer walking through the yard. We had a pool tournament in the game room then hit the Hot tub. Friends would love to go again sometime. Such a delightful cabin! Beyond gorgeous with a comfortable woodsy atmosphere. Definitely a great weekend getaway. Thank you for your hospitality, this cabin was truly amazing!! Enjoyed every moment in Ashford, Elb & Mt. Rainier National Park (acsessed via Nisqually entrance). Took my girlfriend here for her 40th birthday retreat. Needless to say she fell in love, and wanted more time. We will be back for sure. The cabin was beautiful , nicely furnished, kitchen well equipped. Very clean. We had a wonderful time down there. Was very roomy, handled 8 adults well. Would have been nice to have a bathroom upstairs, as the staircase (in the dark) was noisy and a little scary (steep) Our major complaint was their choice of cable packages . Know this probably isn't Important when the weather is nice or during the summer months, but we were there after Christmas , rain the whole time we were there. Our choice of channels were shopping , informercials, old tv shows, and 4 local stations. No sports, which is what we wanted, during the bowl season. But an upgrade to a better package wouldn’t add that much to the cost. We loved the roaring water from the creek. The kitchen was well equipped, knives need to be sharpened . Needed 9v batteries in the drawer for the smoke alarms that kept beeping. The game room, off the garage, really smelled musty. Needs to be freshened. All in all we had a wonderful time, fun time with the family. Rates are subject to change until reservation is confirmed. 2-night minimum stay required on weekends (Fri/Sat must be booked together). 3-night minimum stay required over Federal Holiday weekends: Martin Luther King Jr. Day, President's Day, Memorial Day, and Labor Day.